Human design dynamics are like Fluid Dynamics: When the various constituent parts of a talented team all vector to a clearly defined strategic destination, creative productivity just flows; and, turbulence caused by internal friction is avoided. Strategic Leisure's Whole Leadership drives a Laminar Design process, as there is alignment of the multidisciplinary design tasks and resources around the the strategy. When the Strategic Design is clearly defined, Strategic Leisure leads the Physical, Communications, Operations and Development designs, which flow from a carefully cast formation of talent, efficiently and cohesively moving forward. In fluid dynamics, Laminar Flow occurs when a fluid flows in parallel layers, with no disruption between the layers. 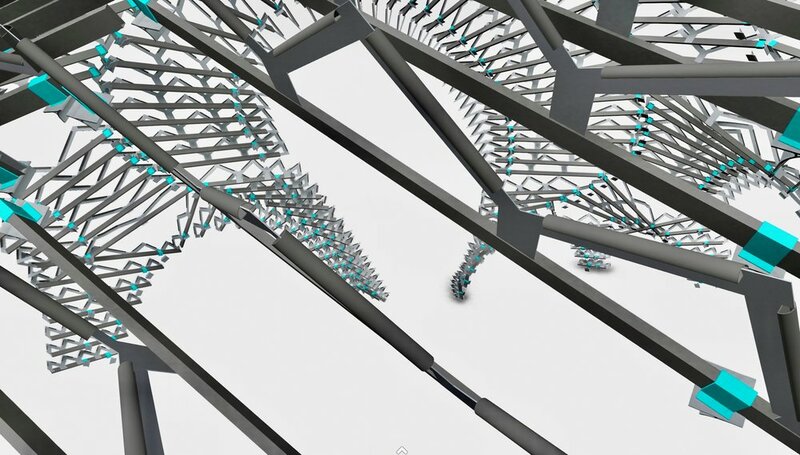 Laminar Flow is efficient, as there is no or very low viscosity, which causes Turbulence. Viscosity is the state of being thick, sticky and semifluid in consistency, due to internal friction. Click an aligned layer of Laminar Design for examples of Strategic Leisure's work. Strategic Leisure understands that Physical Design as like conducting an orchestra: after selecting the strategic music, carefully selecting the musicians, understanding the range and timbre of dozens of instruments, determining First Chair, choosing the key, tempo and interpretation, and guiding the melodies, harmonies and tactical discord into a emotionally rewarding whole. Strategic Leisure sees Communications Design is the process of engaging the community of constituents at every level of public and professional participation in the strategic definition, creative design and active development of an experiential place. Strategic Leisure understands the Legal, Demand & Capacity and Financial pragmatics upon successful operations are built. Strategic Leisure approaches Development Design as a form of storytelling, of what you want to build and why. With a clear and compelling story told with integrity and passion, you get the chance to manifest that story physically. At its most fundamental level, Strategic Design starts with the future place's positioning within the highly competitive market for precious slices of the public's discretionary time and spending. Secondary research of the current facts on the ground, as well as benchmarking the tactical, molecular structure of best practices, both within the given market and globally, is the beginning. Why do you expect them to come? What do you want to feel in this new place (as market behavior is driven by emotions)? How do you expect the market to behave in terms of length of stay, spending and repeat visitation? 1. 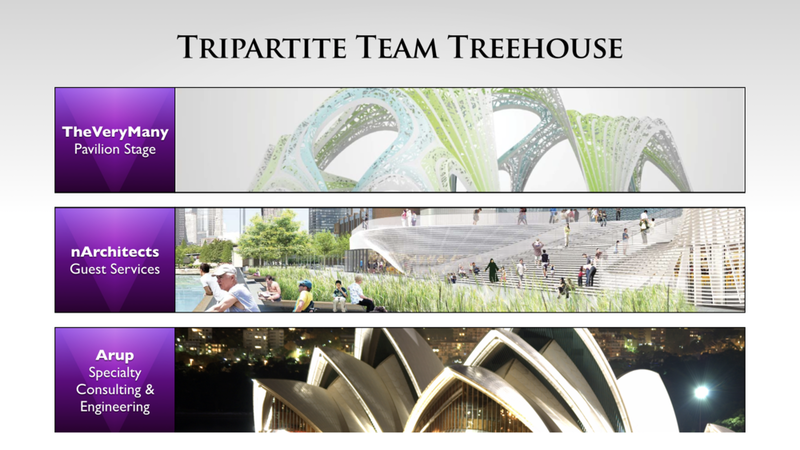 We understand that creativity in Physical Design starts in designing the team, itself. 2. 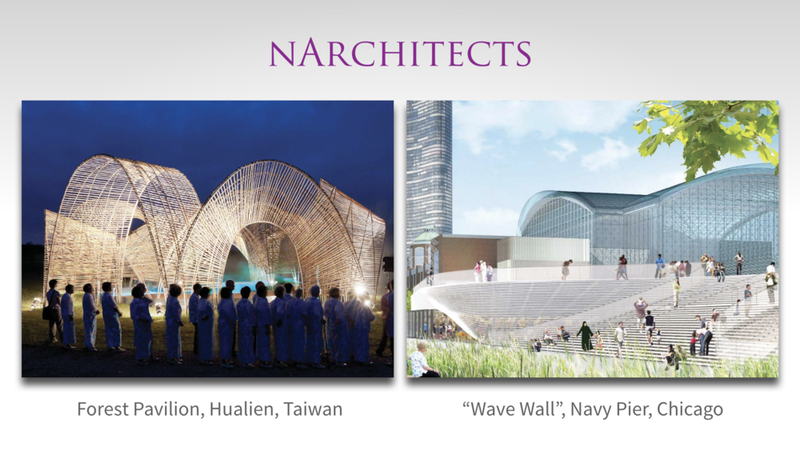 We understand the power of Parametric Design (design via programming algorithms) with CNC (computer numerical control) fabrication, which places the fabricator / builder directly in the Design Team, can produce remarkable results. 3. 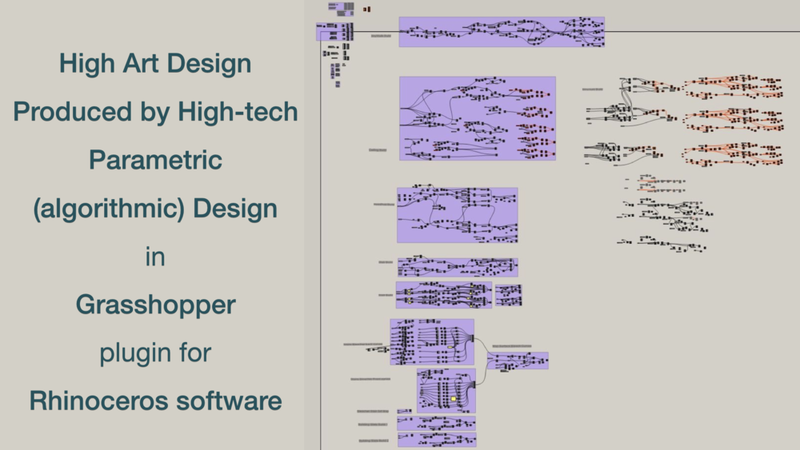 We understand that from Artists to Engineers, and Architects in between, great design comes from a team of great designers in every role, at every level. Michael McCall of Strategic Leisure identified and engaged Artists Marc Fornes, Martha Schwartz, William Cochran, and Cliff Garten, who have all provided brilliant designs for functional-art; and, Painter & Concept Artist and Graphic Artist, R. Tom Gilleon and Randy Morgan, respectively. Michael McCall of Strategic Leisure identified and engaged global Engineering firm Arup (engineers: Principal Greg Giammalvo, Associate Brian Markham, Associate Matt Larson & Structural Engineer Jordan Woodson) and globally known Engineering; Fabrication & Installation firm A. Zahner Company (led by engineer and artist, Bill Zahner, with Senior Vice President Robert Zahner, Chief Operating Officer Tom Zahner, Vice President Engineering/Sales Tony Birchler, Senior Project Engineer Shannon Cole and Manager of Advanced Manufacturing Jeff Cunningham). 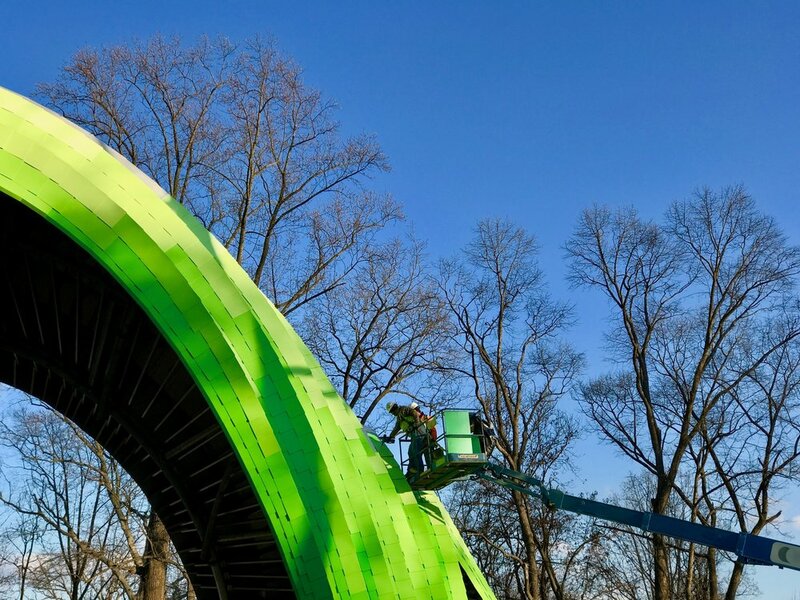 Both firms have been instrumental designers of the Chrysalis, creating the physical sculptural form designed by Artist/Architect, Marc Fornes of THEVERYMANY. 4. We understand that some Tactical Design – like Theatrical Facilities, Lighting, Sound & Grand Scale Media – can have huge strategic impact. Michael McCall of Strategic Leisure identified and engaged global Consulting Engineering firm Arup for both Theatrical Consulting and Lighting Design (Arup Principal Raj Patel, Associate Principal Ed Arenius, Senior Theatrical Consultant Michael Parrella, and Lighting Designer Star Davis), and Multimedia Systems Design, Installation, Integration and Programming firm, Technomedia (Senior Vice President Dan Moalli), Production Designer and Entertainment Architect Stufish (the late Mark Fisher), and Lighting Designer Stefen Graf. 5. We understand that the Nesting of Design reinforces strategic identity at all scales. 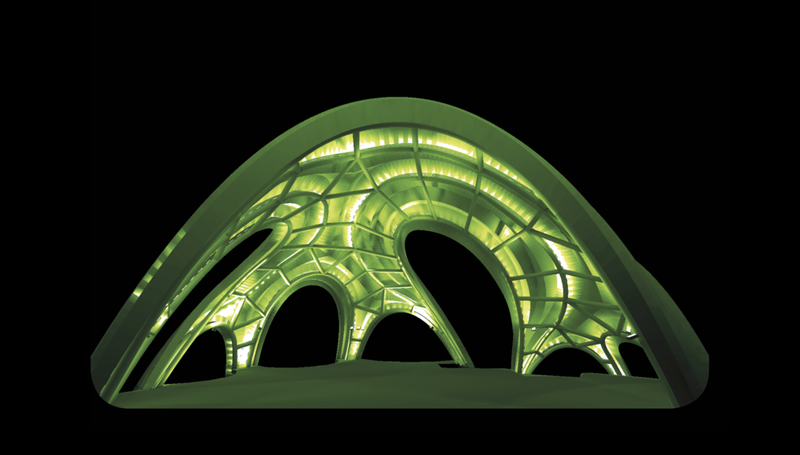 An outcome of Laminar Design is the continuity of design at all scales of the manifestation of a given strategy. Nesting of Design is the result of the clear and compelling expression of strategy, as all the design elements fit in to the whole of the strategy, from a masterplan of thousands of acres, down to the a logo the size of a postage stamp, and at all building scales in between. Communications Design is the process of engaging the community of constituents at every level of public and professional participation in the development of an experiential place; from the internal team, to the bands of engaged constituents that ripple out from – and back into – the process and the project. Strategic Leisure knows well the critical importance of engaging public and private sector leaders and the community at large; for without their support, nothing of strategic and creative import can be accomplished. Keys to effective communications and successful results are forthrightness, integrity, engaged listening and of course patience. Perhaps most importantly, however, is 100% believing in what you are saying, as even those who disagree (and these voices will always exist), nonetheless respect those speak from a position of caring conviction. 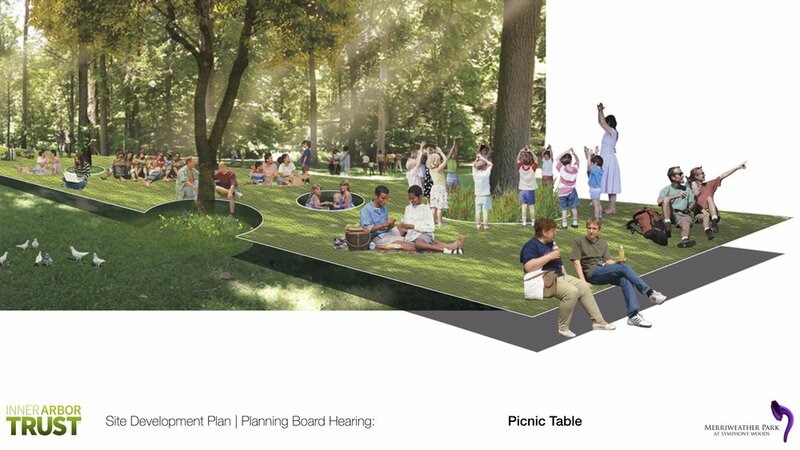 For Merriweather Park at Symphony Woods, Michael McCall started as a citizen himself, questioning the strategic appropriateness of a park design being proposed by landowner, Columbia Association. 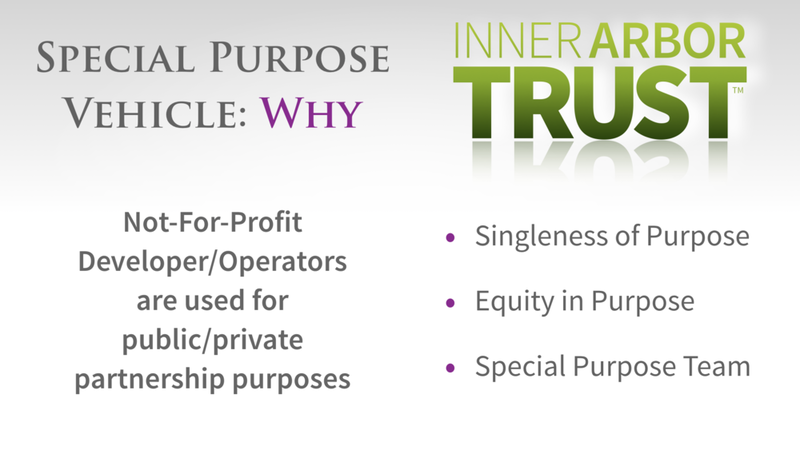 From this beginning as an informed citizen, Michael (via Strategic Leisure) was asked by the landowner to form and lead a new 501(c)(3), the Inner Arbor Trust. Before any new designs were revealed, Michael introduced the new design team, the “Designers of Delight,” to the community on a very personal level. 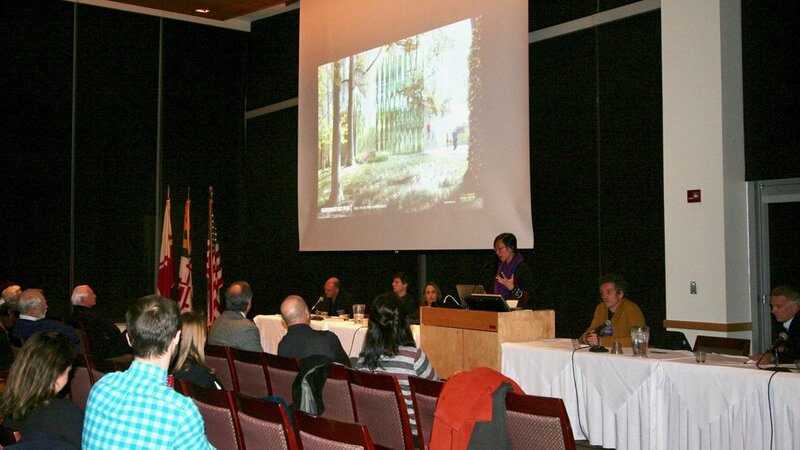 Many dozens of presentations later, the new Park plan was unanimously passed by the Howard County, Maryland, Design Advisory Panel and was unanimously made the law of the land by the Planning Board. 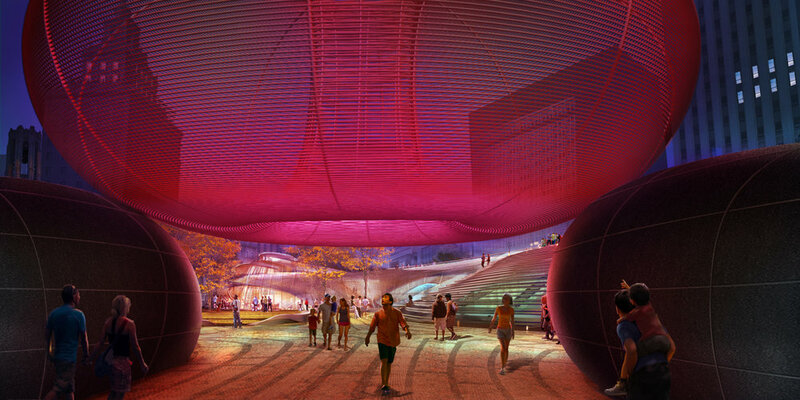 Today, the Park's first phase, the iconic Chrysalis, actively and passively entertains the public. Before Columbia Association voted 8 to 2 to adopt what the Board referred to as the "McCall Plan", and to form an independent Special Purpose Vehicle, provide a perpetual easement and provide $1.6 Million in startup capital for the plan's development, a Baltimore Sun feature article was orchestrated and an open-house was hosted by Columbia Association, where Michael McCall introduced the plan to the Columbia, Maryland community. Click the three images below to go to the respective full Baltimore Sun articles. After the historic 8 to 2 vote for the enabling legislation on February 14, 2013, the following week Columbia Association placed the below ad for the Inner Arbor Plan, co-developed with Strategic Leisure, on the back of the Columbia Flier. Click the image below to go to the full Baltimore Sun article. Michael McCall, President & CEO of the Inner Arbor Trust (via Strategic Leisure), has recruited all of the "At Large" Inner Arbor Trust Board Members since the organizations inception. Since the age of 22, Michael McCall of Strategic Leisure has been the client of millions of dollars of real estate related legal services, from the biggest international firms to boutique practices. When going to work for his mentor, James W. Rouse, at age 25, Michael's immediate boss, George P. Barker, Esq, a Princeton and Columbia Universities educated attorney, was also a legal mentor. 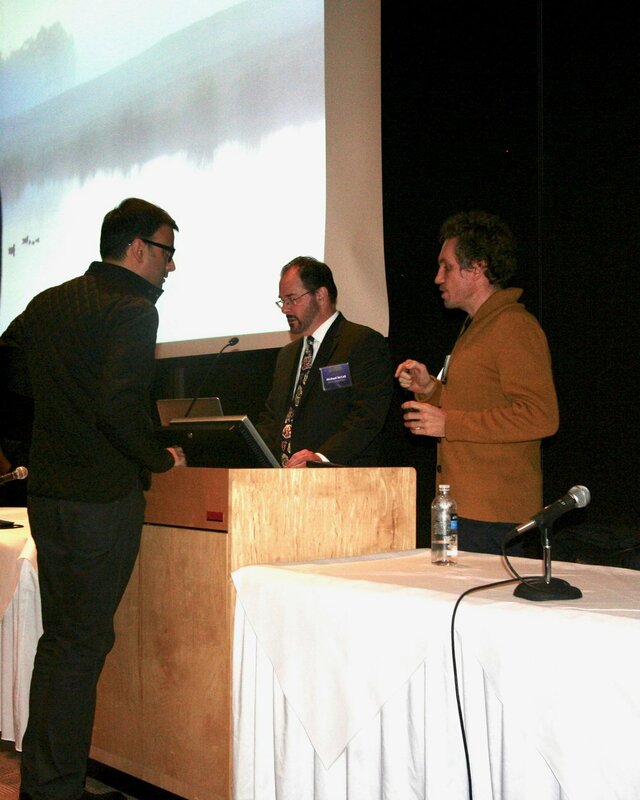 Experiential Places are real estate, founded in law, and often complex relationships. 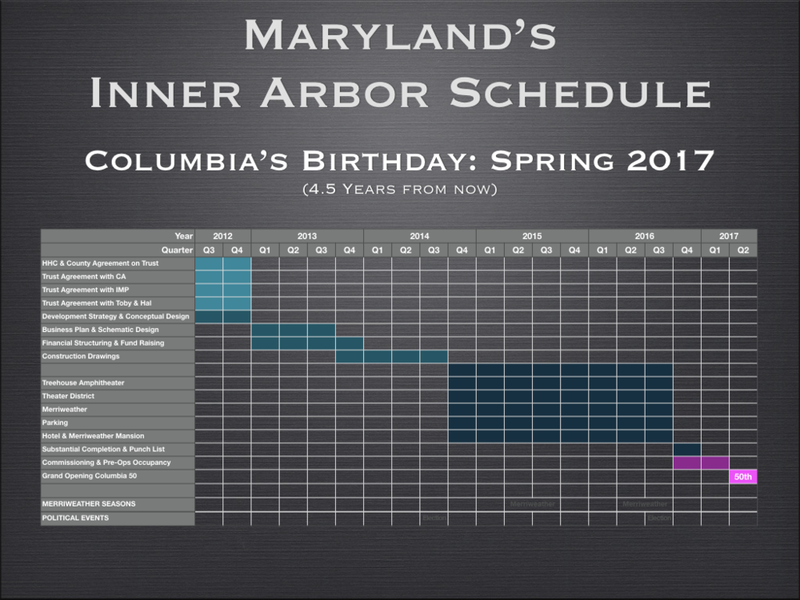 Prior to the creation of the Inner Arbor Trust, Michael McCall worked with Columbia Association on the strategy for and formation of a not-for-profit Special Purpose Vehicle, which would hold a Perpetual Easement over 50-acres of land in downtown Columbia, Maryland (a 14,000 acres, 100,000 person Newtown, developed by Michael's mentor, James W. Rouse). 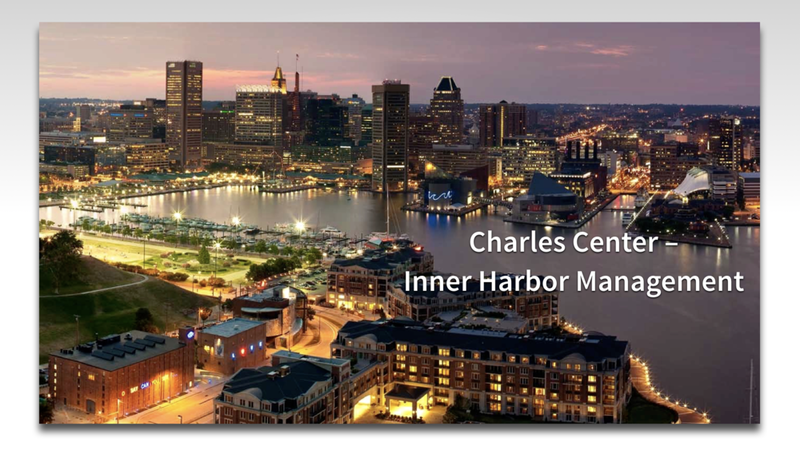 As the President and CEO of the Inner Arbor Trust (via contract with Strategic Leisure), Michael spearheaded a series of mission critical agreements with Columbia Association, The Howard Hughes Corporation, It's My Amphiteaater, Inc. (DBA Merriweather Post Pavilion), and Howard County, Maryland. 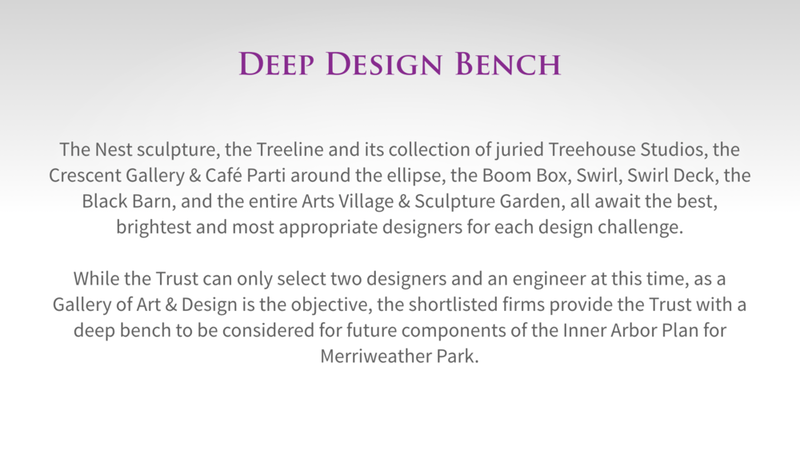 The Legal Design of the Inner Arbor Trust and Merriweather Park at Symphony Woods, is captured in the below listed publicly available documents. Click the titles below for a PDF of each agreement executed by Michael McCall, as President and CEO of the Inner Arbor Trust, via contract with Strategic Leisure. 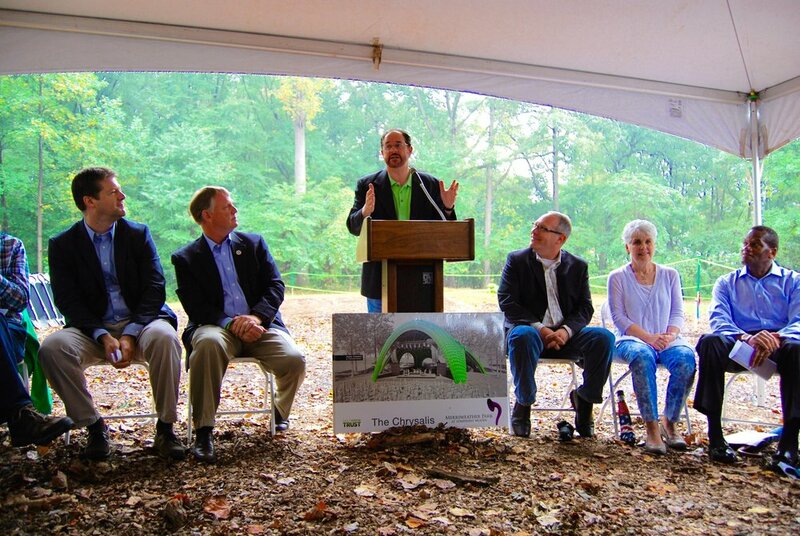 Sheri Fanaroff, Esq., General Counsel of Columbia Association, and Michael McCall, President and CEO of the Inner Arbor Trust, describe the legal underpinnings of the Merriweather Park at Symphony Woods. Sheri talks about the creation of the Trust at about 24:00 minutes and Michael at about 38:00 minutes. 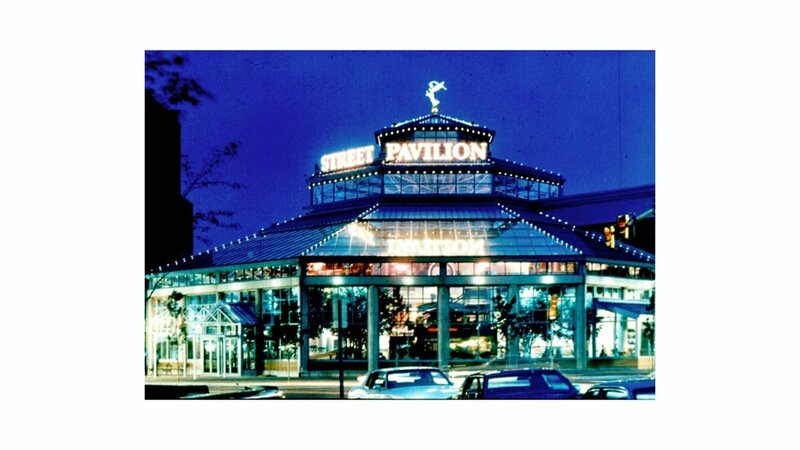 As the President and CEO of the Inner Arbor Trust (via contract with Strategic Leisure), Michael negotiated and executed all the Architectural & Engineering, Design/Build and Construction contracts for the design of Merriweather Park at Symphony Woods and the design and construction of the Chrysalis. 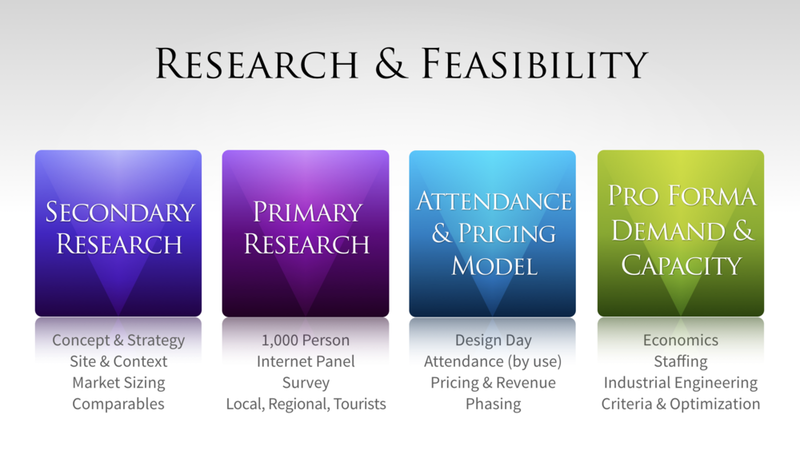 Sophisticated, statistically valid, third party Demand Research is an indispensable tool in physically and economically right-sizing the Experiential Place, and in communicating that demonstrated appeal to third parties. 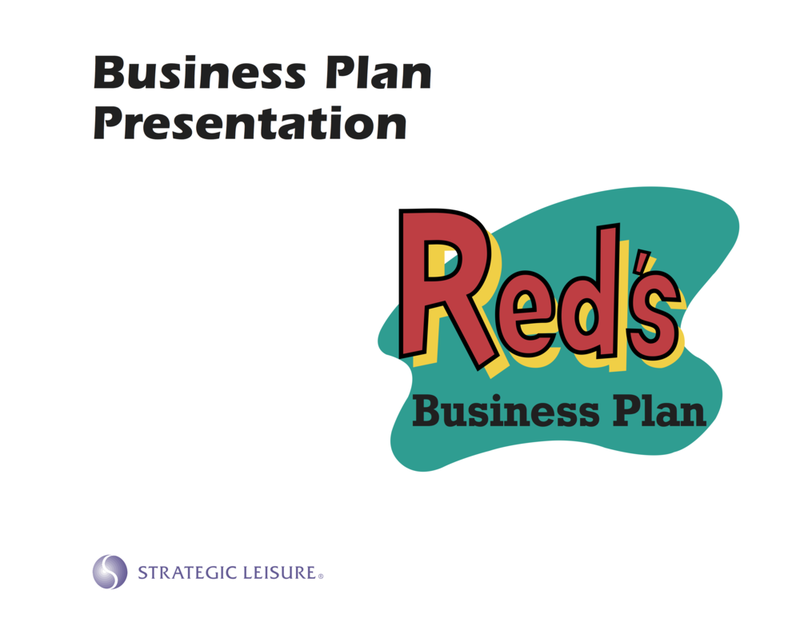 Michael McCall of Strategic Leisure first learned the value and protocols of destination research from the original master, the late Harrison "Buzz" Price and his partner, Nick Winslow, while leading the Rouse side of the Rouse/Mouse joint venture with The Walt Disney Company. During this two and half year JV form 1985 to 1988, Michael and his team worked under Disney EVP of Strategic Planning, Larry Murphy, and his direct report, Jay Rasulo (who later became Disney's CFO);and with a talented team of Disney business development and research professionals, including Shirley Komoto, Jacqueline Jacobs Caster, Jill Bensley, and outside research consultant Linda Congleton. In addition to James Rouse, Michael was very fortunate to have a Disney mentor, former EVP of Disney Parks & Resorts Bruce Laval, who invented Disney's Fastpass. 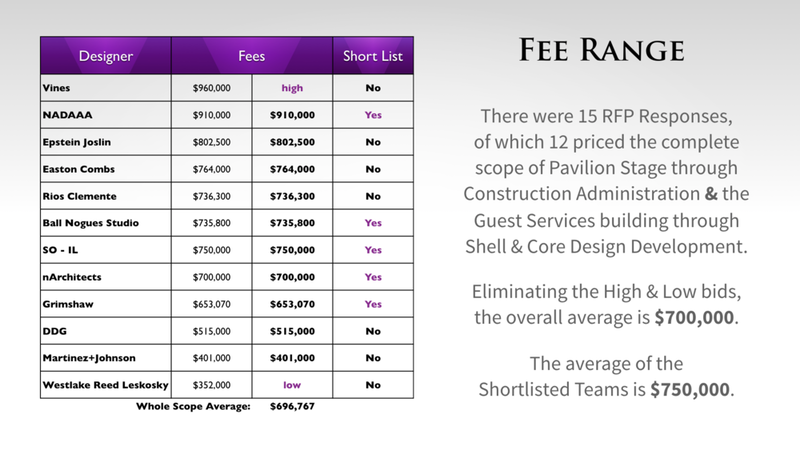 Bruce taught Michael about Demand and Capacity analysis, and how to use Market Research to project demand for types of Experiential Places that had no direct comparable. 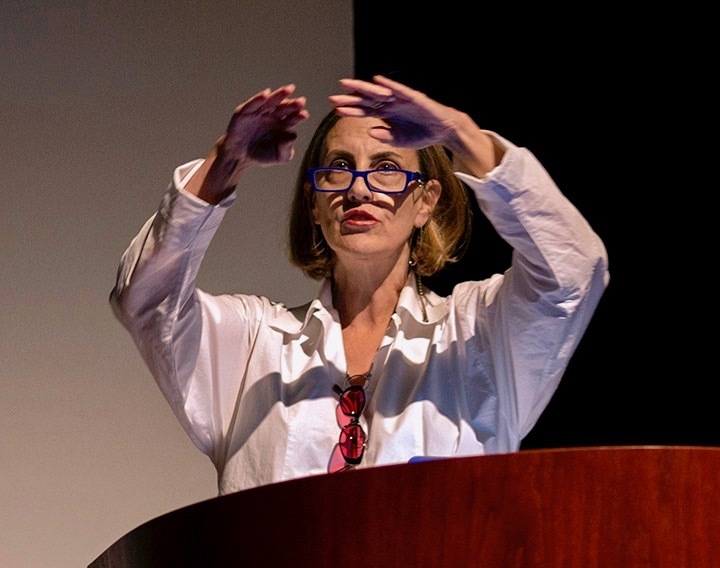 Years later, he also introduced Michael to Joni Newkirk and Scott Sanders (the former SVP and VP of Disney research and forecasting group for all Parks and Resorts, respectively), who had formed Integrated Insight. 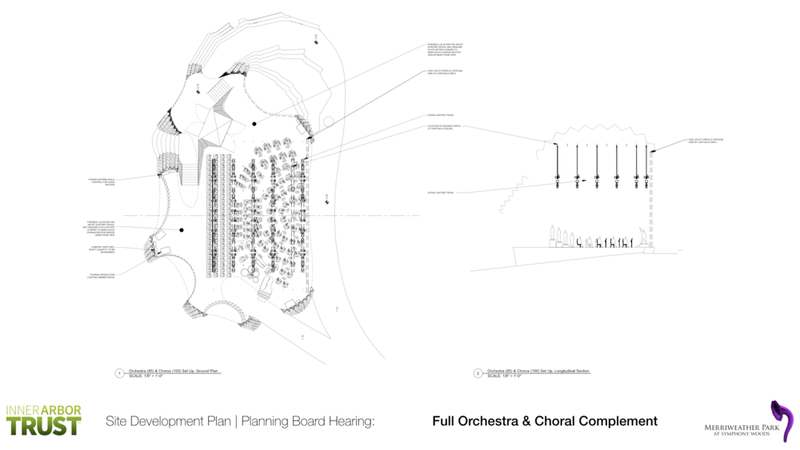 Hence, for Merriweather Park at Symphony Woods, Michael engaged Integrated Insight, and in addition to working closely with Joni and Scott, also worked with the firm's ex-Disney Industrial Engineer, Michael Schweitzer. 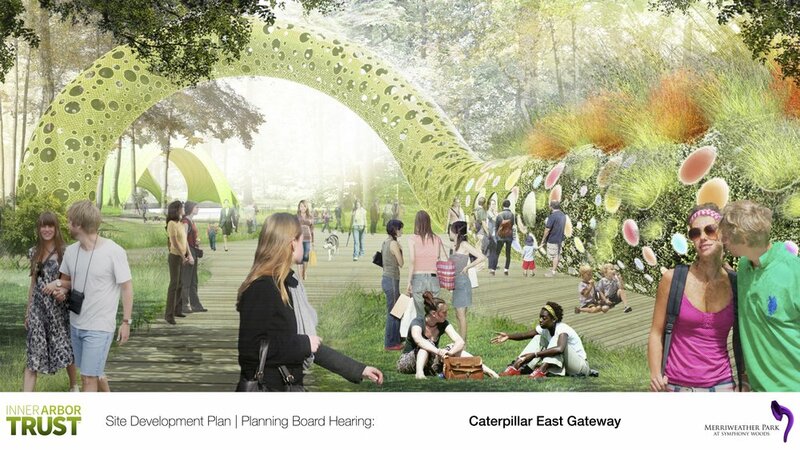 Integrated Insight's research proved, through valid and conservative statistical techniques of a 1,000 person, in depth survey, the strength of Merriweather Park at Symphony Wood's appeal, the results of which were presented to the Columbia community, and the report is published below, via link, in full. For business and even for not-for-profits, it is profit which sustains an operation, employs people and fuels improvement and growth. While evolving from of the developer/ landlord profession, Michael McCall's work with Disney in the Rouse/Mouse joint venture and then Strategic Leisure's focus on product development, has firmly established a point of view grounded in operating businesses. When applied back to the landlord perspective, it makes for a more informed understanding of the tenants economics and ability to pay rent. 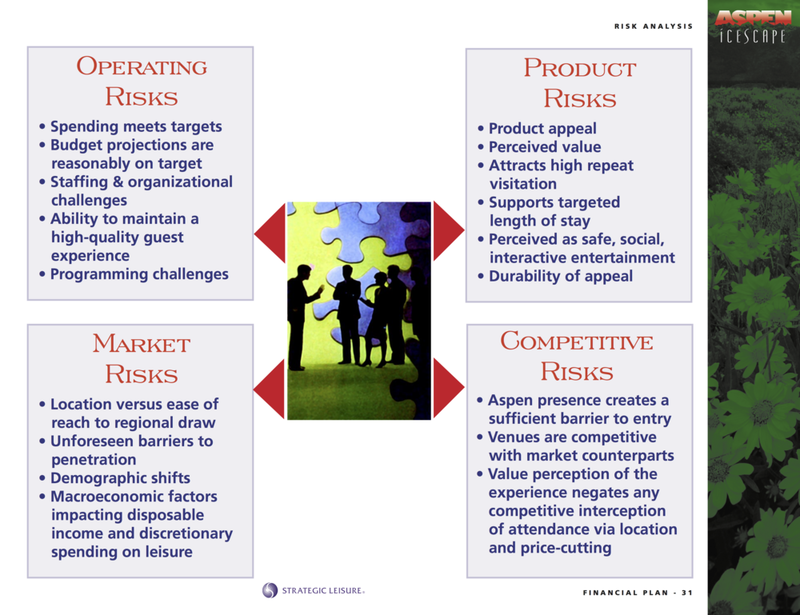 Having had a Disney mentor, former EVP of Disney Parks & Resorts Bruce Laval (who invented Disney's Fastpass), in analyzing businesses, when appropriate Strategic Leisure goes beyond typical real estate pro formas and address industrial engineering of the economics, such as Theoretical Hourly Capacity, and Peak-In-Park attendance vs.Design Day capacity. These theme park metrics and methodologies apply to any guest or customer driven physical business, and are valuable tools in planning or analyzing everyday destinations. 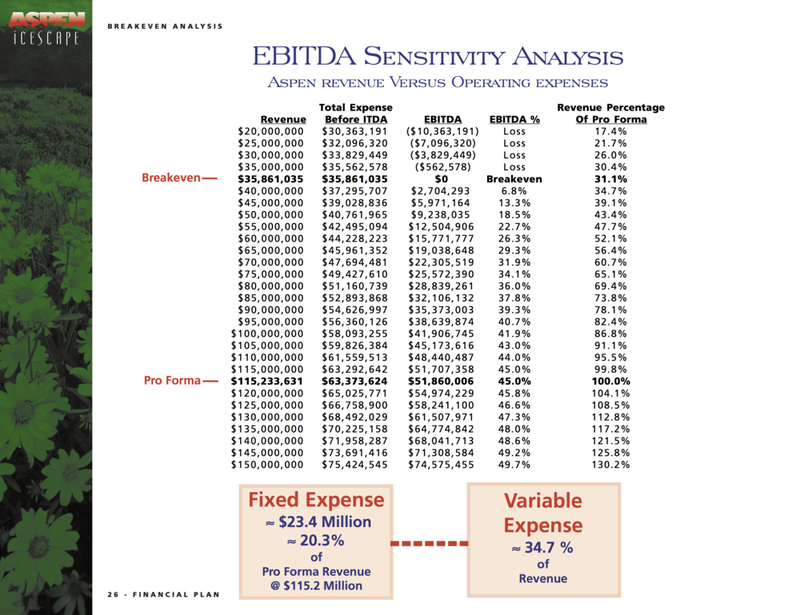 Below are some glimpses into how Strategic Leisure approaches the Financial Design. 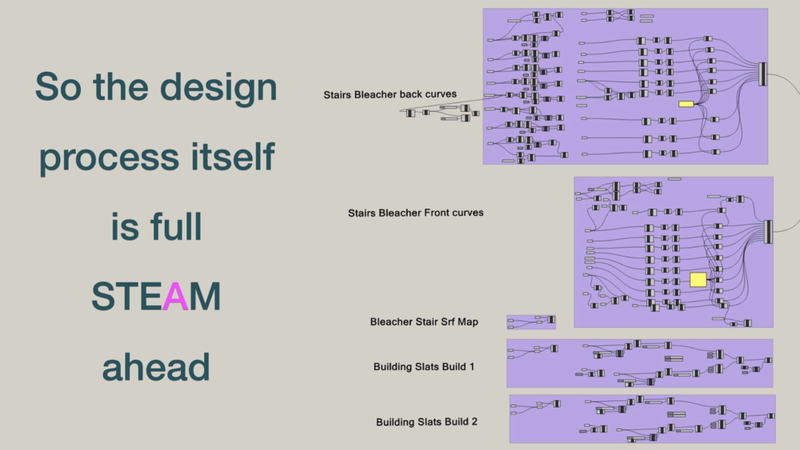 Development Design is a form of storytelling, of what you want to build and why. With a clear and compelling story told with integrity and passion, you get the chance to manifest that story physically, brick by brick, or in the case of the Chrysalis, ZEPPS by ZEPPS. Howard County, Maryland, has a very involved process (see flowchart below) for reviewing and approving development plans. Notwithstanding the "Site Development Plan" term, the SDP process covers everything – from the purely aesthetic and to the very technical – about a proposed development. 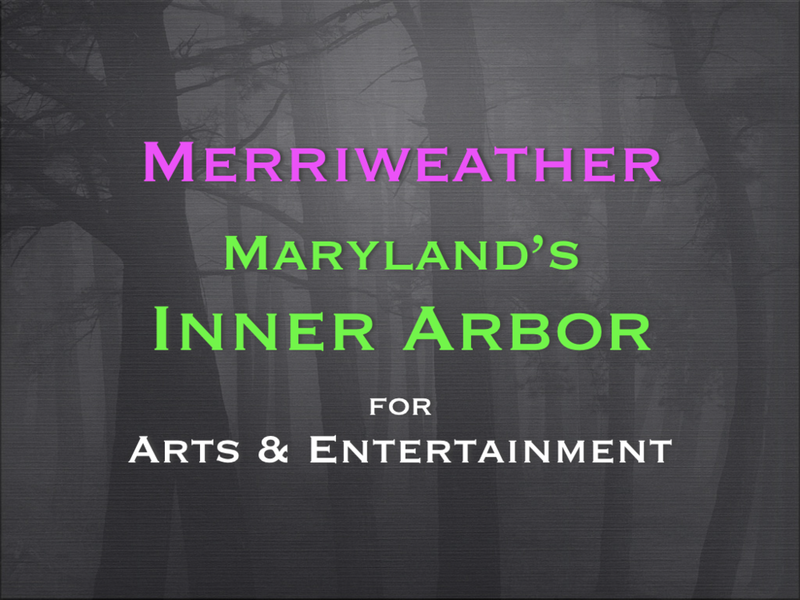 Michael McCall, President and CEO of the Inner Arbor Trust (via contract with Strategic Leisure) led the preparation and presentation of the Merriweather Park at Symphony Woods Park plan, which was endorsed by all five County Council members and unanimously approved by the Howard County Planning Board. 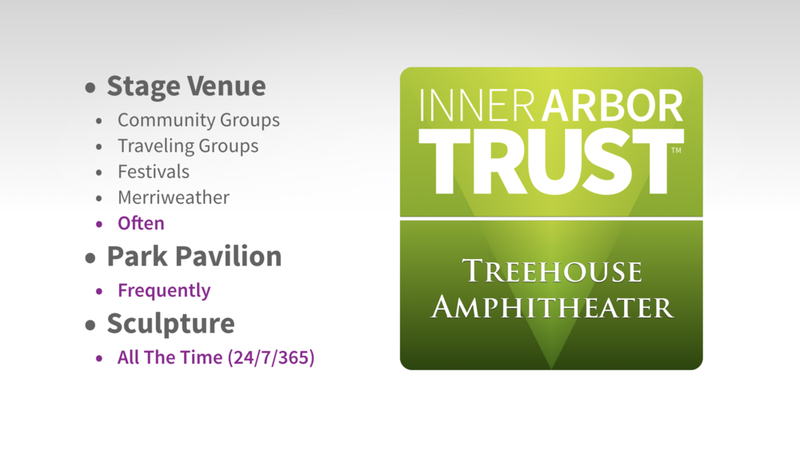 Michael then led the Inner Arbor Trust's cooperative joint planning with the owners and operators of Merriweather Post Pavilion, which was also unanimously approved by Howard County Planning Board, one year later. were done, we felt really, really good about our choices. 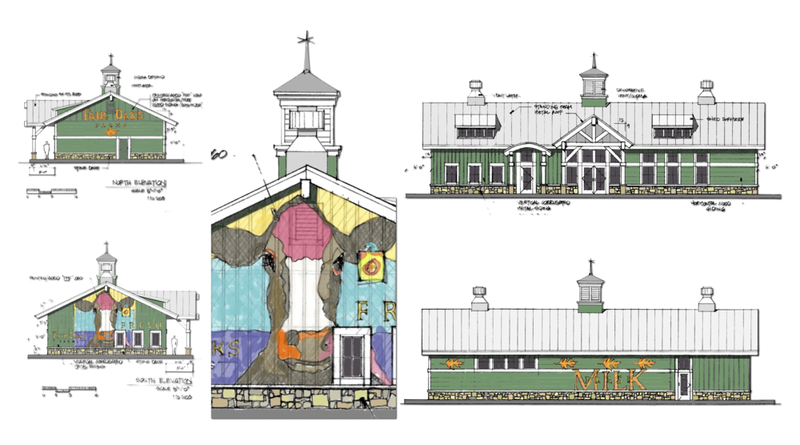 Click the items below for the PDF of the 85 sheet Site Development Plan (SDP 14-073) submitted to Howard County by the Inner Arbor Trust, and unanimously approved by on November 20, 2014. Click below for the PDF of the Joint Site Development Plan (SDP 16-018) submitted to and unanimously approved by, Howard County, by the Inner Arbor Trust and a subsidiary of The Howard Hughes Corporation, then the owner of Merriweather Post Pavilion. 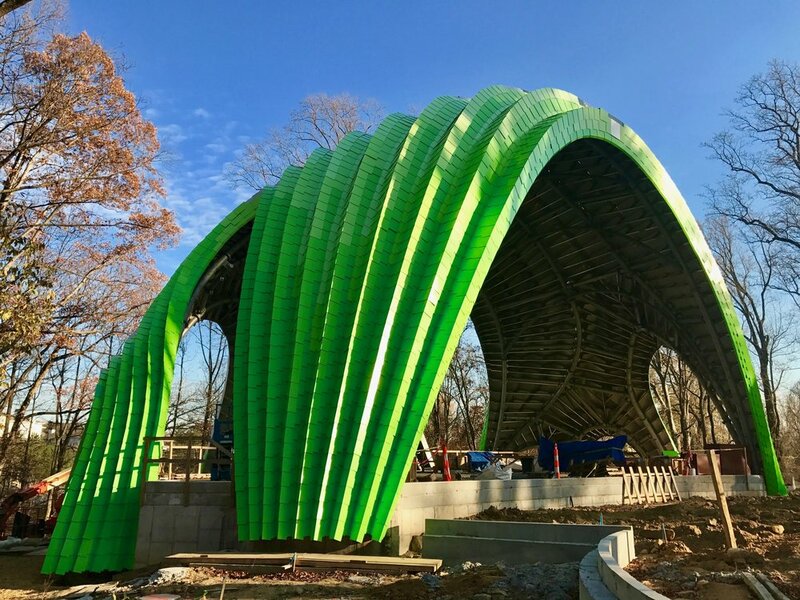 The first phase of the seven part Merriweather Park at Symphony Woods plan, the Chrysalis Stage | Pavilion | Sculpture, started construction in September, 2015 and will open in April, 2017.